Playing a tabletop RPG lets you stop being your regular self in your regular life for a while and escape to new worlds and new adventures. Well, adding even more new worlds to those new worlds is a good thing. Such is the case with the Kickstarter I'm talking about here. 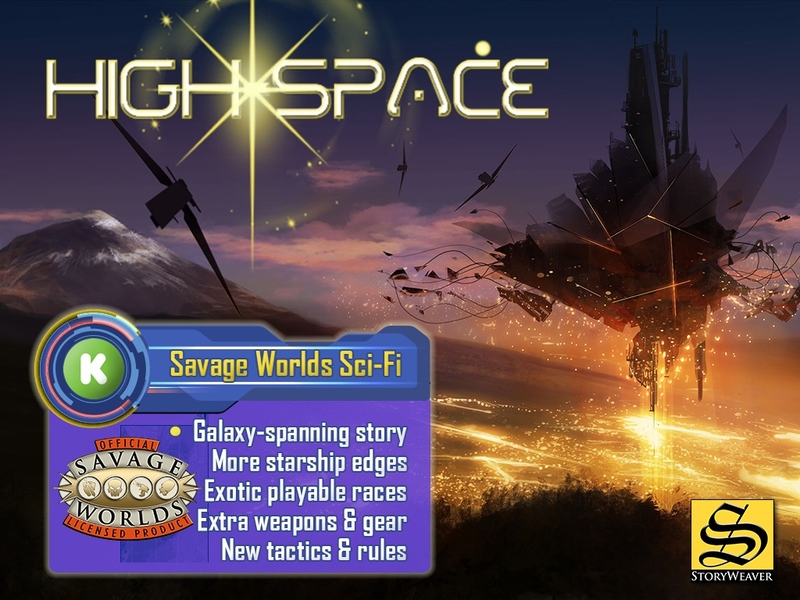 High-Space is a sci-fi RPG setting on its own, but now it's coming to Savage Worlds and expanding out from what is already published for the game. This new expansion looks to bring new playable races to your character-building list. There's also new backgrounds, Edges, Skills, and Hindrances. Basically, there's all sorts of new ways to personalize and customize your character. Along with that, what's a sci-fi setting without space ships? Well, there's more of them as well, plus revised rules for building them yourself, along with new space fight rules. Ok, so you've got your new character and transportation among the stars. You've gotta have something to go out and find, which is where the new alien races come in (both civilized and non-civilized). The campaign is about 3/5 of the way to their goal. You've got some time to decide if you want in, too, since it's set to run for another 55 days.